The formula’s herbal mix includes that cleansing support from senna leaf extract, which works with your body’s natural elimination process. **Senna has been shown to decrease the mean transit time of digestive waste. Taken just once a day, this formula is a convenient way to incorporate an effective cleans without interfering with your everyday routine. 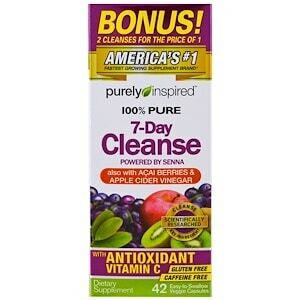 New Purely Inspired 100% Pure 7-Day Cleanse is subject to quality controls. Get the results you want! Get new Purely Inspired 100% Pure 7-Day Cleanse today! Brazilian Acai: Found naturally in the Amazon rainforest, this once little-know berry is a superfruit powerhouse. Apple Cider Vinegar: Not just for salads, apple cider vinegar has become an extremely popular supplement too. 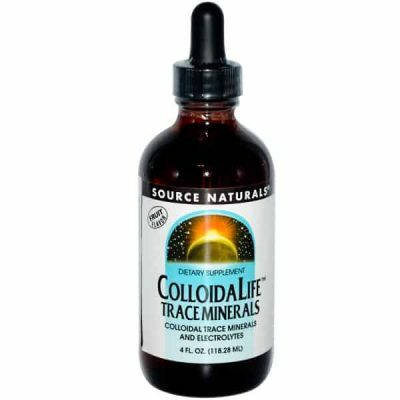 Antioxidant & Digestive Enzyme: Contains vitamin C, papain – a digestive enzyme – and LactoSporte (Bacillus coagulans) probiotic. ♦Based on AC Nielsen data comparing unit and dollar sales percent growth vs. previous 52 weeks ending June 6, 2015. Individual tolerance may vary, please refer to the chart below. Take 1 serving (3 capsules) with food at least 8 oz. of water once daily before bed. If desired effects are achieved while assessing your tolerance with 2 capsules, maintain that dose. Do not exceed 3 capsules in a 24-hour period. For occasional use only. Do not use for more than 7 consecutive days. Consume 8 to 10 glasses of water daily. Read the entire label before use and follow directions provided. Take 1 capsule before bed. Take 2 capsules before bed. Take 3 capsules before bed. Capsule (hypromellose, water), microcrystaline celulose, silicon dixoide, magnesium stearate. For adults use only. Do not use if pregnant or nursing. This product contains senna. Read and follow direction carefully. Do not use if you have or develop diarrhea, loose stools or abdominal pain, because senna may worsen these conditions and be harmful to your health. Consult a medical doctor if you have frequent diarrhea. Consult a medical doctor if you have medical condition or before starting any diet or exercise program. Keep out of reach of children. Store in a cool, dry place (60° to 80°F).